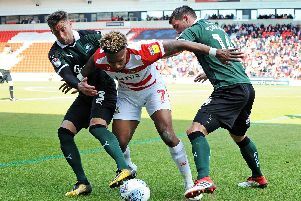 Darren Ferguson is planning for all eventualities when it comes to his summer recruitment drive, according to assistant boss Gavin Strachan. Discussions are understood to be underway at board level regarding next season’s playing budget. Ferguson, whose side travel to Oldham Athletic today, is keen for the club to push on and build on a season of consolidation back in League One. Mindful of the injuries that have caused problems this term, the Scot would like a bigger first team squad and has spoken publically about his wish for two players for each position. Ferguson is in the process of presenting those plans to the board and has earmarked several potential signings based on the different levels of finance he might have available to him. “It’s up to us to plan for different eventualities,” said Strachan. “There’s a plan X, Y and Z for different potential budgets, or different targets. “If you don’t get this one, what do you do? Different bands of targets, if you like. That’s our job. “We feel that whatever way it’s looking we’ve got players targeted that can help the core of what we’ve got here now and try and make that next step next season. “I imagine the people above me will probably have discussions at the end of the season.